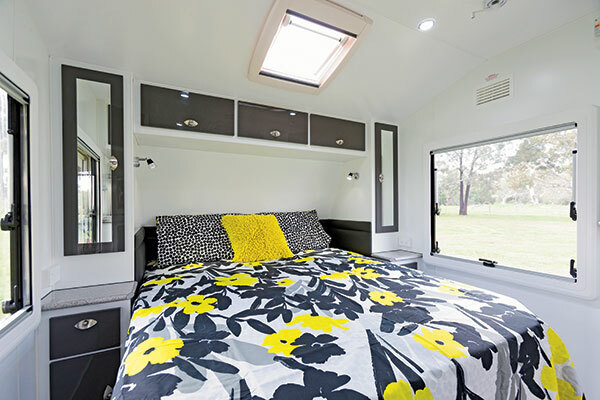 La Vista Caravans has forged a reputation for building value-for-money, entry-level vans with a top-of-the-town appearance. 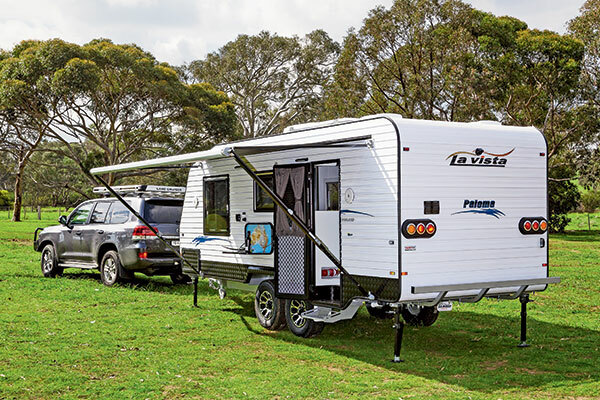 Based in Campbellfield, Vic, and now in its 10th year, La Vista Caravans was established by Alan Nisbet and Mary Lorenzo. Alan has extensive plumbing experience in the caravan industry while Mary, who is of Spanish descent, keeps the administrative wheels turning and is the brainchild behind the company’s name and the monikers of La Vista’s models. Here, we test-towed the 6.5m (21ft 4in) Paloma – its Hispanic translation is ‘butterfly’ – and it proved a stylish on-road tourer. I was impressed with its neat external lines and nice internal touches, which evoked a more top-end indulgence than its near-entry-level price of $60,990 (on-road) intends. Here is a van built on passion and pride, I thought. There is nothing outlandish about the Paloma, with its unpretentious white high-ridge aluminium cladding. But, occasionally, plain and simple wins the day. 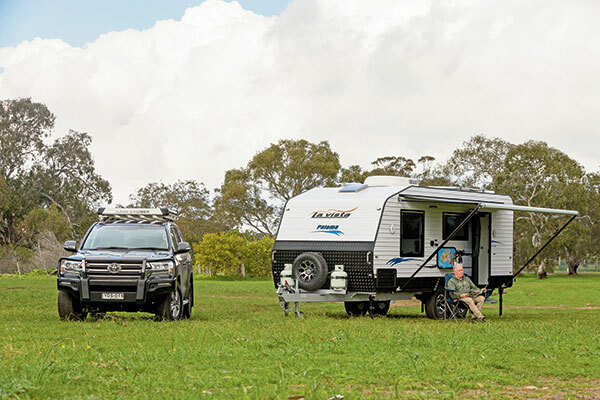 The optional Simplicity load-sharing independent suspension, which is designed for the tough Australian outback, gives this Paloma semi-offroad capability. All you’d need to add for more serious off-grid credibility would be a beef-up in the battery, solar and water departments, plus an inverter and wheel/tyre upgrade. 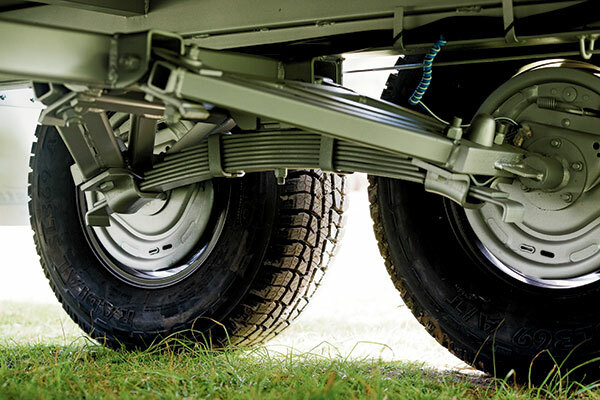 Interestingly, La Vista plans to take on the offroad caravan market this year so watch this space. The Paloma rides on a 6in G&S SupaGal chassis and 15in all-terrain tyres and with a Tare of 2200kg, it floated like a butterfly behind our Toyota LandCruiser 200 Series GXL TD on test. That type of Tare, and laden ATM of 2620kg, proved no trouble at all for the LC200 but puts it out of the large range of tow vehicles with a carrying capacity of 2500kg. The van’s standard AL-KO ESC gives it added stability on the bitumen and gravel or national park roads. 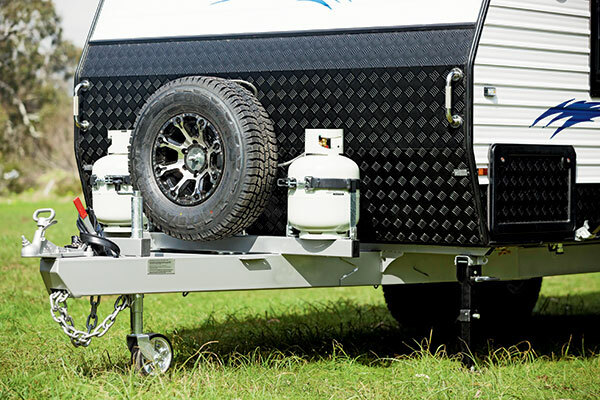 Up front, the Paloma’s A-frame is a simple affair with a standard 50mm ball coupling, mesh tray, double-clamped jockey wheel, water tap, plus twin 9kg gas cylinders and a spare wheel which sit on a horizontal galvanised rail mounted on the drawbar. Although the van’s front end has high black checkerplate, I thought the inclusion of a stoneguard for protection and a front storage locker would be welcome additions. Even thought its built primarily for the blacktop, a stoneguard is an easy and inexpensive way to protect your investment from rogue flying rocks. Apart from the dual access front tunnel boot, the Paloma is a bit short on external storage for a van of this size. But I did like the easily accessible location of a recessed electrical suite in an offside hatch, and the checkerplate protection for the battery boxes (although the Paloma only carries a single 100Ah gel battery). The Paloma’s 190L water volume and 150W solar capacity would be suitable for mid-range trips but wouldn’t cut the mustard out in the whoop-whoops, away from mains pressure water and mains power, for extended periods. The Paloma has the requisite pull-out step, roll-out awning, external speakers and LED lighting on the doorside, but it was the picnic table that really caught my eye. Once dropped down, it reveals a travel-inspiring map of Australia and I reckon it would become a point of conversation around the campsite, with many more destination being added to the bucket list as a result. At the rear, there’s a reversing camera and a simple three-arm bumper bar. An entry-level van will never have the whole kit and caboodle, so I understand the omission of a slide-out kitchen; however, an exterior shower would have gained a few brownie points. 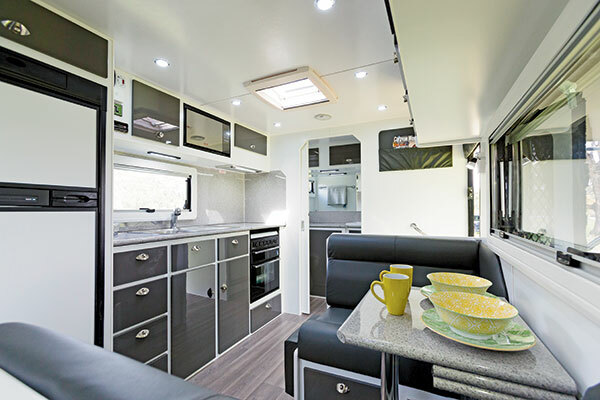 Inside, the Paloma has a vibrant designer colour scheme. It’s nigh on impossible not to be impressed by the metallic-coloured ultra-glaze Urban Republic NX340 cupboard doors, gravel-coloured Mistio Grigio benchtops, and Fumo-coloured (charcoal) genuine leather upholstery, which was a surprise inclusion. Attention to detail is also evident in the piano-hinged cabinetry that has full extension drawer runners with ball bearing slides and attractive brushed aluminium push handles with inbuilt lock mechanisms. Comfort and style is the order of the day in the front bedroom complete with an innerspring caravan-queen-size bed, spacious wardrobes, corner cupboards and built-in dressing tables with slide-out drawers, and panoramic double-glazed windows (with European blinds) that maximise natural light and ventilation. There is also a roof-mounted Aircommand Ibis 3 air-conditioner centrally located at the front of the bedroom. Opposite the entry door, the fully-equipped kitchen comprises a Swift four-burner combo with oven, rangehood, a sink with drainer, and a 25L Swift DLuxx microwave that I reckon is positioned a little too high to be easy or safe to access. 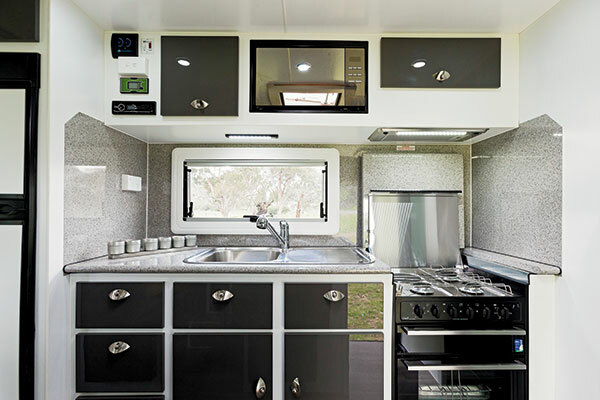 There is plenty of storage space inside the van, particularly under the sink, and above the rolled-edge benchtop is a JVC system, HWS switch for the 23L Suburban gas/electric system, RV Electronics battery monitor and a level indicator for the water tanks. And adjacent to the kitchen is the 184L Thetford three-way fridge/freezer. Directly opposite the kitchen, the living zone is spacious and welcomes a feeling of complete relaxation. You can stretch out on the café dinette’s 100 per cent genuine leather seating with footrests. 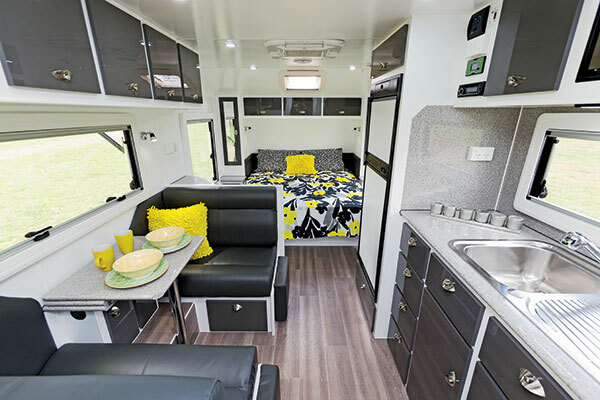 Storage is impressive with five overhead lockers, slide-out drawers under the seats, and two small cupboards, which house a double powerpoint and a USB outlet, underneath a tri-fold table. A full ensuite at the rear of the van epitomises convenience and practicality. For starters, there’s a 3.5kg top-loading Destination RV washing machine, a dirty clothes hamper (just to keep things organised), virtually a full-length mirror above the vanity, and a separate full-height one-piece moulded fibreglass shower (with a 12V hatch that has a LED lighting perimeter) and Thetford porcelain bowl toilet (also with a 12V hatch, and a window above). The abundant internal storage theme continues in the bathroom, with a pull-out cupboard under the sink, a recessed compartment and two lift-up lockers above the vanity. There’s also a towel ring and cup holder at the washbasin and a towel rail and toilet roll holder mounted on the back of a sliding door. 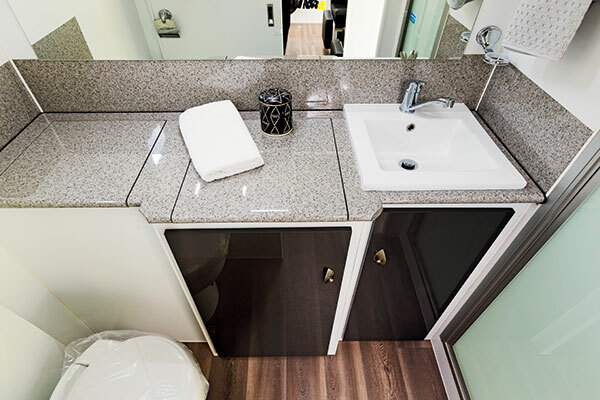 Other inclusions not always seen on entry-level caravans are a stainless steel grab rail (right of entry) and magazine holders (front wall of rear ensuite; and directly behind the entry door). There are also NCE internal speakers at the front of bed and outside the ensuite entry, and a centrally located hatch just left of the entry door. La Vista, translated from the Spanish, means ‘the view’; and that’s quite apt. You’ll certainly be able to experience many spectacular vistas exploring with this tasteful on-road tourer. At $60,990, as tested, the beauty of the Paloma is that it won’t cost you an arm and a leg to obtain a dollop of high-end luxury. It hasn’t got all the airs and graces, but it definitely bats well above its weight! And it would only take a handful of enhancements to make the Paloma more conducive to off-grid adventure, if indeed that is your whim. You will be saying ‘hasta la vista’ (“see you later”) to life’s proverbial mouse wheel in the Paloma. The full test appears in Caravan World #560 2017. Subscribe today for the latest caravan reviews and news every month!